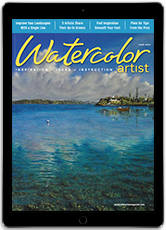 Subscribe Watercolor Artist and Get a FREE GIFT! 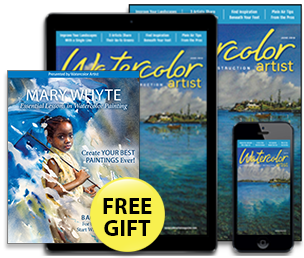 Subscribe now and with your paid order you’ll receive the exclusive digital download Mary Whyte: Essential Lessons in Watercolor Painting. 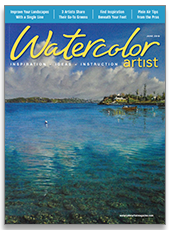 Canada and Foreign All-Access and Print Only subscription: Canada add $7.00. Foreign add $10.00. 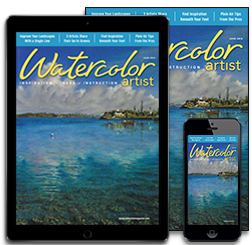 SUBSCRIBERS' AUTOMATIC RENEWAL FEATURE: I understand that I will receive uninterrupted service and delivery of my magazine and that my subscription will be automatically renewed each year at the rate then in effect. I won't be bothered with any renewal notices in the mail; instead, I will receive a clearly marked annual reminder 6 weeks before my credit card is charged. I may cancel at any time during my subscription and receive a refund on any unmailed issues by calling 1-800-811-9834 (U.S.), 1-386-246-3371 (Int'l).